Built for the Ibero-American Exposition in 1929, what the Plaza de España may lack in history, compared to the Giralda Cathedral or Alcazár, it certainly makes up for in sheer grandness and beauty. Walking up to it, you almost expect to hear some passionate classical music to be playing in the background, welcoming you to this impressive sight (or maybe that’s just me). A vast, semicircular complex next to the Parque de María Luisa, the Plaza de España combines detailed, ornate beauty with absolute immensity. This scene had been my desktop background for months before I came to Seville, but nothing prepared me for its size and spellbinding effect. The castle-like edifice and tile work, the moat running along the building, the bridges, the fountains…it’s no wonder thousands of people visit this plaza each year. 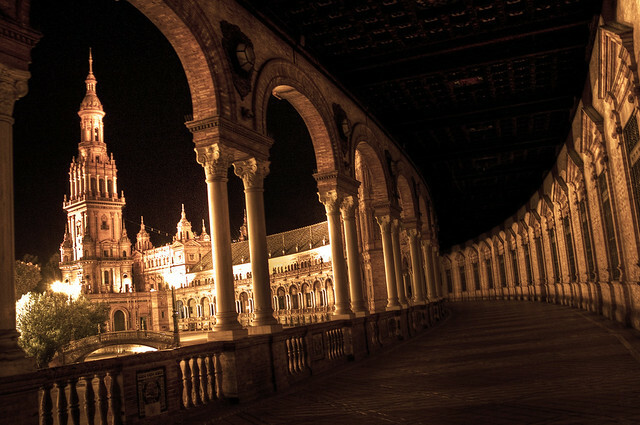 One interesting fact about the Plaza de España, is that it has been the set for several Hollywood movies. In Lawrence of Arabia, it was used to portray the entry of the General Allenby in alleged Damascus, where the plaza itself portrayed the headquarters of the British Officers. And remember planet Naboo in Star Wars: Attack of the Clones? Yep, it was the Plaza de España. This past August, it was also used to film a scene in the newest Sasha Baron Cohen film, Finchley Dreams. In 1929, Seville hosted the Ibero-American Exposition, a world’s fair for the purpose of improving relations between Spain and the countries in attendance, many of them being former colonies. In preparation for the World Fair, Spain constructed many new buildings to hold exhibits from their country as well as others. 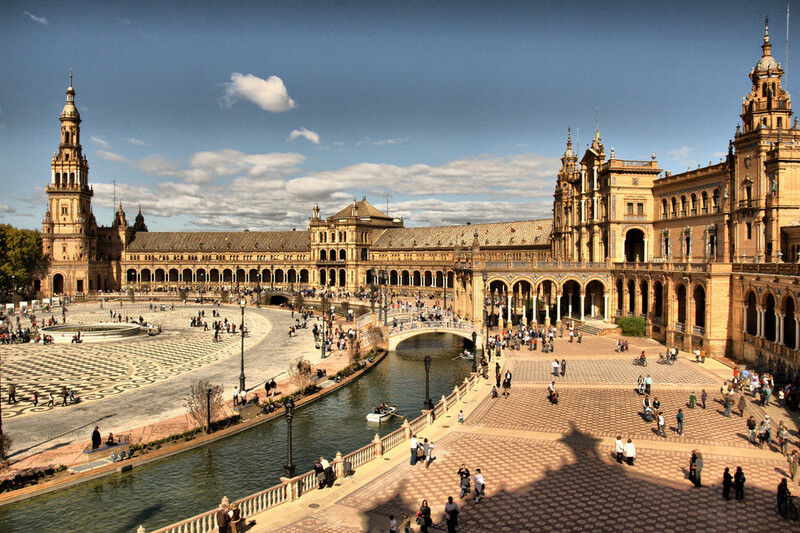 The most famous building to hold these exhibits was built by Spanish architect Don Aníbal González and is what currently surrounds the Plaza de España today. As I strolled along, underneath the overhang of the buildings, I looked out through the archways into the center of the plaza, trying to comprehend the immense size. From time to time I would stop to listen to the soothing hum of a Spanish ballad being played on guitar or the the amusing sight of a vendor trying to teach two tourists a flamenco beat with castanets. Although I have a few more months of being able to visit the Plaza de España, I wanted each moment of my first visit to be permanently impressed in my memory. But with the sights and sounds surrounding me at Plaza de España, it is certainly an experience that will stay with me for years after leave.